Today I found out caterpillars’ bodies “melt” almost completely before morphing into butterflies in the chrysalis. It was thought until very recently that the caterpillar was completely converted to goo, excepting certain special cells necessary to create the butterfly body parts. This idea has recently been debunked with researchers at Georgetown University proving that moths retain at least some of the memories they had when they were caterpillars. For this to be the case, at least some of their memory storing neurons must survive the enzyme digestion process. Further, these neurons must somehow be incorporated into the moth or butterfly’s brain, which is quite a bit larger and more complex than a caterpillar’s brain. Also left within the goo are very tiny imaginal disks, which are similar to embryonic cells. These disks are actually present within the caterpillar its whole life, but they stop growing at a certain point in the caterpillar’s development and only start again when it is time for the caterpillar to morph into a butterfly. Once the proper time comes, the imaginal disks use the nutrients from the digested body of the caterpillar as they form into different parts of the butterfly’s body, with different disks forming into different tissues. For instance, there are imaginal disks that will form the legs, antennae, specific organs, etc. of the butterfly. There are even four imaginal disks that form wings. If one of these forming wings is removed, the other three will simply adapt to form bigger wings to compensate for the loss of the one wing. Once the process is complete, the imaginal disks ultimately replace nearly every part of the dissolved caterpillar’s body with new “parts”, forming the butterfly. Caterpillars and Butterflies have a variety of means of protecting themselves from predators. One of the most interesting found with Lycaenidae (of which 6000 species exist worldwide) is through communicating with ants using various vibrations and chemical signals. Using this, they somehow reach an agreement with the ants in that the ants will provide them some level of protection and, in exchange, the ants will be provided with an additional food source (honeydew secretions). Other types of caterpillars are able to inflate their heads which makes them resemble small snakes. These even often have false eye spots to further make the head look like a snake head when they inflate it. Another type of defense mechanism found with some types of caterpillars is using chemical excretions. These can range from smelly to highly toxic chemicals. Some types of caterpillars even purposefully ingest toxic plant matter which their bodies are then able to retain, even through into adulthood. If some predator chooses then to eat the caterpillar or butterfly that has retained these toxic chemicals, they get sick and possibly die themselves as a result. This toxicity from certain caterpillars can occasionally cause problems for humans. This happens particularly when these hairs with toxic chemicals are released into the air and come in contact with skin or are breathed into the lungs. In Brazil alone, there were 354 such cases that were reported between 1989 and 2005, with about 20% of these cases resulting in the death of the person afflicted. A common misconception is that a cocoon and a chrysalis are the same thing. In fact, the chrysalis is a butterfly pupa, which is a hard skin which appears after the caterpillar’s final shedding of its skin when it’s attached to a leaf via a silk pad spun by the caterpillar. A cocoon is just a silk casing used by moths and certain other types of insects. 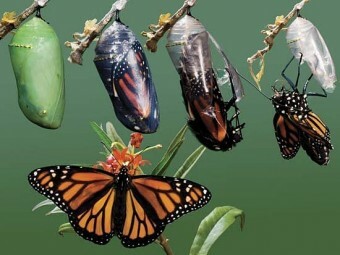 The process of metamorphosis from a caterpillar to a butterfly consumes an amazing amount of energy. This is evidenced by the fact that the difference in weight between the adult butterfly, when it first emerges, from the time around 3 days after the chrysalis is formed has the butterfly weighing about half what it did before as a result of various chemical reactions. Once their metamorphosis is complete, butterflies use a special liquid which is formulated to soften the chrysalis; once softened, they use their sharp claws to claw their way out. After they emerge, they begin the process of expanding and hardening and drying their wings. This process can take several hours and it is a time when the butterflies are extremely vulnerable. The specific research project that showed moths retain some memories from when they were caterpillars was done at Georgetown University on tobacco hornworm caterpillars. They trained the caterpillars to avoid certain smells. When the caterpillars morphed into moths, they retained the aversion to those smells while those not trained had no such aversion. Interestingly, they also found if they only trained caterpillars when they were very young (before three weeks old) and not again as “mature” caterpillars, they would not remember to avoid the smells when they turned into moths. Only when the caterpillars were trained close to their metamorphosis would they remember. The complete butterfly lifecycle is: egg, larva (caterpillar), pupa, and, eventually, adult butterfly. Contrary to popular belief, many butterflies do not have exceptionally short life spans with some living as much as a year. Interestingly, butterfly eggs end up being attached to leaves via a special type of extremely strong glue which is, to date, unknown in terms of its chemical make-up. The glue works so well that once the bristles are attached to the silk pad with this glue, it is nearly impossible to separate them. The eggs themselves can last anywhere from a few weeks, to several months, if it’s winter time, before hatching. Monarch butterflies are known to migrate around 3000 miles during their lifetime, from Mexico to Southern Canada. Fossil records indicate butterflies have been around on the Earth at least 40-50 million years. What Takes Place Inside the Chrysalis? Can Moths or Butterflies Remember What They Learned as Caterpillars? A butterfly is much lighter than a pupa. You claim this is because matter is converted into energy. You cannot possibly mean this (as in E=mc^2). There is no matter “converted” to energy. What you should say is that sugars are burned, releasing energy from chemical bonds, and releasing water vapor and carbon dioxide (hence the reduced weight). I would just like to say here that my teenage daughter wanting her space as she has moved from our home is like the caterpillar entering the chrysalis. It is a very natural normal thing for the human transformation into adulthood to separate from the parent and ‘find’ themselves. I look forward to a magnificent butterfly coming soon! While difficult, I will try to be patient with her metamorphosis stage. I found one of these buried in my lawn the other day. It was in a hard, thick, black shell with a pointed end. I thought it was a grub in a shell, and when it started moving around in my hand, I threw it onto the street. Later, when i walked by, i noticed there was a creamy, green soup coming from it, as if it had exploded. Nothing had squeezed it or anything, so im not sure why. (this isn’t my question, but if you could answer this that’d be great). So if it’s nothing but green pulp on the inside, how was it able to move in my hand? The rear end with the point slowly rotated back and forth.